1 cup bread crumbs I actually prefer a more traditional crumb to Panko here. Just FYI. Toss the asparagus in the corn starch. You can do this in a large bowl or in a sealed gallon size ziplock bag. In a large, shallow bowl or plate with a lip, whisk one egg. In another large, shallow bowl or plate with a lip, combine 1/2 cup bread crumbs with 1/4 cup Parmesan. Dip the asparagus in the egg, then into the bread crumbs. Set on a plate until you've dipped all of them. About half way through I like to refresh my egg and bread crumb plates because clumps will begin to form. You want a thin, non-clumpy coat of each of these elements on the asparagus before they go in the oven. So don't be afraid to clean off those bowls or plates and refresh if you need. Coat a baking sheet in 2-3 teaspoons olive oil. Use your (clean) hands to spread the oil so the whole sheet is covered. This will help the asparagus to not stick while they bake. Bake at 400°F for 20-25 minutes. 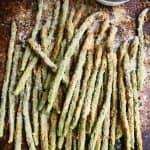 After the first 8-10 minutes, remove from the oven and flip the asparagus over before continuing to bake. While those bake, it's time to make our creamy lemon sauce. Guess what? There's only two ingredients plus seasoning needed. Whisk together 1/2 cup mayo with the juice from one lemon. Taste and add salt and pepper to your liking.